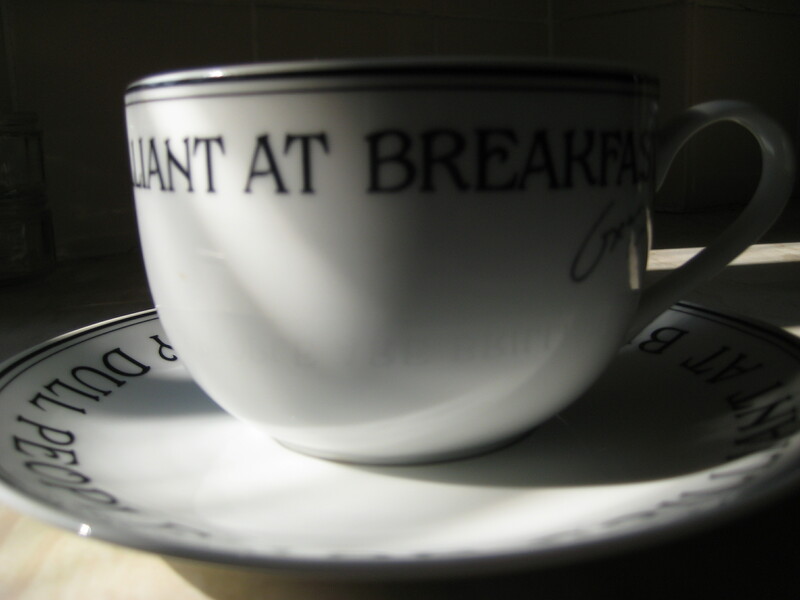 Breakfast is Brilliant – James Proclaims! It’s always good to throw in an Oscar Wilde quote, as evidence of one’s own wit. It’s a strange vicarious thrill. I’m quoting Oscar Wilde, therefore I’m equally as droll as the celebrated 19th century playwright. On that basis, and to prove my own wittiness, I shall quote him now. “Only dull people are brilliant at breakfast” is something he apparently said. I know this, not because I’ve read ‘The Importance of being Earnest’, ‘An Ideal Husband’ and ‘Lady Windemere’s Fan’ (all in one handy ‘omnibus’ style tome) and indeed seen at least one of the above performed on stage, thus making me, indisputably an expert on Oscar Wilde. No, I am aware of this particular quote because it appears on a novelty cup and saucer I own (I think a gift from the same aunt who bought me the plastic lightsaber I mentioned in a recent post). Anyway, erudite and educated as I clearly am, I am certainly no genius first thing in the morning. Indeed there is something of the primate about me when first I stumble out of bed. So I can only conclude that anyone who is capable of being ‘brilliant’ at that time of the day must, as Wilde surmises, be exceptionally dull the rest of the time. But one thing that is consistently brilliant at that time of day, is the breakfast itself. I love breakfast. Obviously it’s a stupid word from an etymological point of view. Breakfast, as I recall being taught by an earnest teacher when in primary school (earnest by nature not Earnest by name, to avoid any Wildean confusion here) originates from the notion of breaking a fast. But it’s a bit of an overstatement to suggest that while I have been sleeping, I have been fasting. Fasting suggests a great deal more willpower than that which is required to lie horizontally on a comfortable mattress and loudly snore intermittently for six to eight hours. That takes literally no will power at all. But in order to fully descend into cliche, which clearly is the only way to go when you start a missive with Oscar Wilde quotes, I firmly believe that breakfast is the most important meal of the day. But it’s also the one with by far the most exciting options. There’s the ‘Full English’ or variant thereof (known often as the ‘Full Welsh’ in my homeland – I couldn’t comment on what the Scottish or Irish would call it, they may have their own versions), you can go continental, with croissants, pains au chocolat and various other pastries. You can throw in American style pancakes, with bacon and maple syrup. Or, if dignity is not your thing, a cold slice of last night’s pizza. Breakfast is wonderful and there are so many exciting options. I’m writing this using the free wifi in my local Wetherspoons pub having just eaten a breakfast wrap, comprising of bacon, sausage, a fried egg , a hash brown and cheese served in a wrap and very nice it was too. Pingback: Baking Bad | James Proclaims! I like the way you’ve woven ideas and concepts together here…beginning with Wilde, ending with your own wrap. Dude…very cool. Thanks – I think this one is still my favourite. This is brilliant!!! I’m adding you to my “blogroll”. Please inquire as to the etymology of that word, or if not, just give me your opin. I’m sure it will be an interesting one. Thanks!! (PS, I’m very much a morning person, named Dawn, but ready for a solid nap by 1.) Great post! Thanks for the comment, the add to the blogroll (your guess is as good as mine!) and the tweet! Pingback: James Has A Sick Day – James Proclaims! Pingback: I Am So Clever That Sometimes I Don’t Understand A Single Word Of What I Am Saying – James Proclaims!